Some caregivers need help when the person is in the early stages of Alzheimer’s disease. 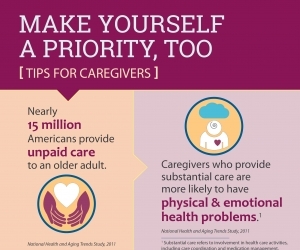 Other caregivers look for help when the person is in the later stages of Alzheimer’s. It's okay to seek help whenever you need it. As the person moves through the stages of Alzheimer’s, he or she will need more care. One reason is that medicines used to treat Alzheimer’s disease can only control symptoms; they cannot cure the disease. Symptoms, such as memory loss and confusion, will get worse over time. Because of this, you will need more help. You may feel that asking for help shows weakness or a lack of caring, but the opposite is true. Asking for help shows your strength. It means you know your limits and when to seek support. According to many caregivers, building a local support system is a key way to get help. Your support system might include a caregiver support group, the local chapter of the Alzheimer's Association, family, friends, and faith groups. The Alzheimer's Association offers information, a help line, and support services to people with Alzheimer’s and their caregivers. Local chapters across the country offer support groups, including many that help with early-stage Alzheimer’s disease. Call or go online to find out where to get help in your area. The Association also funds Alzheimer’s research. The Alzheimer's Foundation of America provides information about how to care for people with Alzheimer’s, as well as a list of services for people with the disease. It also offers information for caregivers and their families through member organizations. Services include a toll-free hotline, publications, and other educational materials. Caregivers often need information about community resources, such as home care, adult day care, and nursing homes. Contact the Eldercare Locator to find these resources in your area. The Eldercare Locator is a service of the Administration on Aging. The Federal Government funds this service. The NIA Information Center offers free publications about aging. Many of these publications are in both English and Spanish. They can be viewed, printed, and ordered online. Here is a list of services that can help you care for the person with Alzheimer’s at home. Find out if these services are offered in your area. Also, contact Medicare to see if they cover the cost of any of these services. See below for Medicare contact information. Home health care services send a home health aide to your home to help you care for a person with Alzheimer’s. These aides provide care and/or company for the person. They may come for a few hours or stay for 24 hours. Some home health aides are better trained and supervised than others. Home health services charge by the hour. Medicare covers some home health service costs. Most insurance plans do not cover these costs. You must pay all costs not covered by Medicare, Medicaid, or insurance. Ask your doctor or other healthcare professional about good home health care services in your area. Search the Internet for "home health care" in your area. Is your service licensed and accredited? What is included and not included in your services? How many days a week and hours a day will an aide come to my home? Is there a minimum number of hours required? How do you check the background and experience of your home health aides? How do you train your home health aides? Can I get special help in an emergency? What types of emergency care can you provide? For more information about home-based long-term care, visit What Is Long-Term Care? Some home health care services are very good; others are not. You should get as much information as possible about a service before you sign an agreement. You need to ask home health care providers for references from people who have used their services. If possible, check for any complaints filed against a service. At Medicare's Home Health Compare, you can learn more about some of the home health care providers in your state. Or call Medicare at 1-800-633-4227 for the same information. You can also check with community, county, or State agencies that regulate health services or contact the Better Business Bureau in your area. Meal services bring hot meals to the person's home or your home. The delivery staff do not feed the person. The person with Alzheimer’s must qualify for the service based on local guidelines. Some groups do not charge for their services. Others may charge a small fee. The Eldercare Locator can help at 1-800-677-1116 or www.eldercare.gov. Or, contact the Meals on Wheels organization at 1-888-998-6325 or www.mealsonwheelsamerica.org. Adult day care services provide a safe environment, activities, and staff who pay attention to the needs of the person with Alzheimer’s in an adult day care facility. They also provide transportation. The facility may pick up the person with Alzheimer’s, take him or her to day care, and then return the person home. Adult day care services provide a much-needed break for you. Adult day care services charge by the hour. Most insurance plans don't cover these costs. You must pay all costs not covered by insurance. Call the National Adult Day Services Association at 1-877-745-1440, or visit www.nadsa.org/consumers/choosing-a-center. Youcan contact the Eldercare Locator at 1-800-677-1116 or at www.eldercare.gov. Respite services provide short-term care for the person with Alzheimer’s at home, in a healthcare facility, or at an adult day center. The care may last for as short as a few hours or as long as several weeks. These services allow you to get a break to rest or go on a vacation. Respite services charge by the hour or by the number of days or weeks that services are provided. Most insurance plans do not cover these costs. You must pay all costs not covered by insurance or other funding sources. Medicare will cover most of the cost of up to 5 days in a row of respite care in a hospital or skilled nursing facility for a person receiving hospice care. Medicaid also may offer assistance. For more information on Medicare and Medicaid, see Paying for Care. There may be other sources of funding in your state. Visit the ARCH National Respite Locator for more information. Visit the ARCH National Respite Locator at archrespite.org/respitelocator. Geriatric care managers make a home visit and suggest needed services. They also can help you get needed services. Geriatric care managers charge by the hour. Most insurance plans don't cover these costs. Medicare does not pay for this service. You will probably have to pay for this service. Call the Aging Life Care Association at 1-520-881-8008, or visit www.aginglifecare.org. Mental health or social work professionals help you understand your feelings, such as anger, sadness, or feeling out of control and overwhelmed, and help you deal with any stress you may be feeling. They also help develop plans for unexpected or sudden events. Professional mental health counselors charge by the hour. There may be big differences in the rates you would be charged from one counselor to another. Some insurance companies will cover some of these costs. Medicare or Medicaid may cover some of these costs. It's a good idea to ask your health insurance staff which counselors and services, if any, your insurance plan covers. Then check with your doctor, local family service agencies, and community mental health agencies for referrals to counselors. Hospice services provide care for a person who is near the end of life. They keep the person who is dying as comfortable and pain-free as possible, and provide care in the home or in a hospice facility. They also support the family in providing in-home or end-of-life care. Hospice services charge by the number of days or weeks that services are provided. Medicare or Medicaid may cover hospice costs. About the National Institutes of Health (NIH): The NIH is the nation's medical research agency, includes 27 Institutes and Centers and is a component of the U.S. Department of Health and Human Services. NIH is the primary federal agency conducting and supporting basic, clinical, and translational medical research, and is investigating the causes, treatments, and cures for both common and rare diseases. For more information about NIH and its programs, visit www.nih.gov.